One of JAMS most esteemed neutrals, Hon. 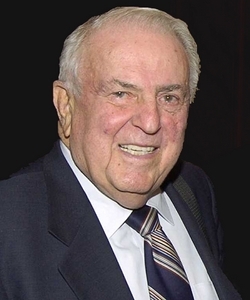 Abner J. Mikva (Ret. ), passed away on Monday, July 4, 2016. Judge Mikva joined JAMS in 1995. He was a dedicated public servant who served with distinction in all three branches of government, including as a five-term Congressman from Illinois, Chief Judge of the United States Court of Appeals for the D.C. Circuit and White House Counsel for President William Clinton. He has also served as a law professor at Northwestern University, the University of Chicago and the University of Illinois. In 2014, Judge Mikva received the Presidential Medal of Freedom, the nation’s highest civilian honor, from President Barack Obama. He was known for his sharp intellect, energy and kindness. While on the JAMS panel, he successfully mediated and arbitrated a wide variety of matters, including complex commercial matters, securities, employment and toxic tort disputes. Judge Mikva also worked to inspire the next generation of public servants through the Mikva Challenge, a non-profit organization he and his wife, Zoe, created to encourage young people to get involved in civic and political activities. Students in Chicago Public Schools serve as interns, volunteer for political campaigns and establish school councils to discuss issues of government and democracy. He is survived by his wife, three daughters Mary, Laurie and Rachel; their husbands Steven Cohen, James Pfander and Mark Rosenberg; and seven grandchildren. Everyone at JAMS, as well as his many friends and colleagues in the legal and political communities across the country, will greatly miss him. There will be a private family funeral and a public memorial will be scheduled for early August. The family invites friends to make a donation to the Ab and Zoe Legacy Fund at Mikva Challenge in lieu of flowers. Visit mikvachallenge.org for more information.